If you’re mapping out your watch list for the weekend, be sure to add in Nor Cal Elite because this west coast program is ready to put on a show. Nor Cal Elite is bringing 12 teams to Palm Springs, California this weekend to compete against the best at the 2019 Spirit Sports: Duel In The Desert. One team they are most excited to debut is Nor Cal Elite Zeus, their first World’s team in five years. Zeus is set to compete in the Level 5 Senior XSmall Coed division. 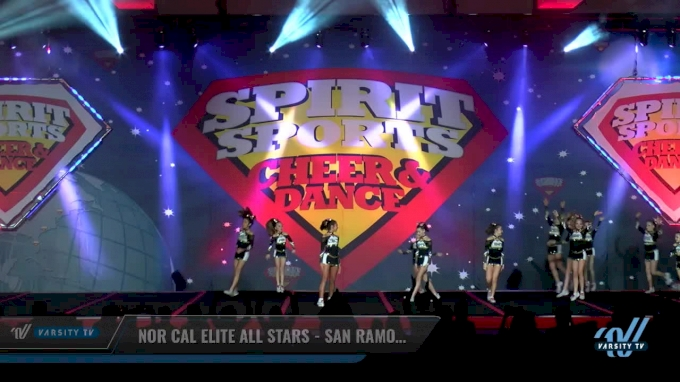 Nor Cal Elite has always been known to produce clean and technical routines. “This season we have put an emphasis on performance and showmanship to help merge the fun cheerleading of the past with the highly-competitive cheerleading of the future,” explained Nor Cal Elite Coach, Rachel Jobe. In preparation for Spirit Sports, Nor Cal Elite has been working hard to create eye-catching choreography to help them stand out. The program was founded of Greek Gods and Goddesses and every year they try to incorporate motions and sections that pay tribute to the God or Goddess that each team is named after. For example, you can see Cupid shooting their bow or Typhoon creating a wave in various parts of the routines. These extra details are the secret to making Nor Cal Elite’s choreography so entertaining to watch. Year after year, Duel In The Desert has been a highlight of Nor Cal Elite’s season. Be sure to tune in to Varsity TV this weekend to cheer on the twelve Nor Cal Elite teams as they take on Spirit Sports: Duel In The Desert 2019!